Am I starting to sense a trend here? Have you noticed that after getting some serious critical acclaim a number of young actresses are immediately running out to do soft PG-13 horror pictures? After really finding her way onto the critics radar with “Martha Marcy May Marlene”, Elizabeth Olsen quickly followed it up with “Silent House”. After making a huge splash in 2011 and giving what may end up being an Oscar-winning performance in 2012’s “Zero Dark Thirty”, Jessica Chastain started off 2013 with “Mama”. And then there’s “House at the End of the Street”. Jennifer Lawrence first wowed critics with “Winters Bone” and then blew up the box office with “The Hunger Games”. She followed it by dipping her toes into the horror genre with a film that’s decent enough and relatively harmless, but that still feels like a quick money draw from her recent success. Lawrence plays Elissa Cassidy, a high school student who moves to a small wooded town with her recently divorced mother Sarah (Elisabeth Shue). They get a great deal on a beautiful home and they later find out why. It seems the property values have gone down following the gruesome murders of a couple in the house next door. Elissa and Sarah begin to find out more about the murders from the locals. But there is the question of what is fact and what is just gossip? They learn that the couple’s son Ryan (Max Thieriot) is living alone in the house. He’s been ostracized by many in the community and he’s the subject of so many rumors and speculations. He becomes the centerpiece of much of the film’s mystery. Obviously Jennifer Lawrence is the real draw here and as you would expect she does a good job. But I have to say this isn’t challenging material. She does a lot of the same old stuff that you would expect from a movie like this. About the only opportunity she gets to flex her acting muscles are in the scenes with Shue. Elissa and Sarah don’t have the best relationship and the film’s better dramatic moments are when these two are hashing it out. Unfortunately we don’t get to much of it. As good as these moments are, they’re just thrown in here and there and they feel like an afterthought. 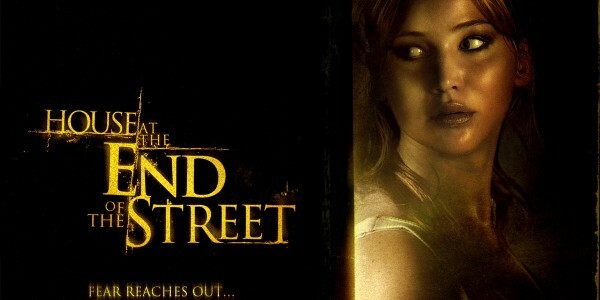 While “House at the End of the Street” is advertised as a horror movie and it does have its moments of standard horror fare, in many ways it feels more like a thriller – not a great one, but a thriller nonetheless. Other than a couple of sudden blasts of loud music, the film doesn’t have any genuine scares. And it never really succeeds in creating the tense and creepy atmosphere it shoots for. But this isn’t a terrible movie. I actually found myself interested in the secrets and twists surrounding the murders in the house next door. The story also remains entertaining despite some obvious plot holes and unintentional silliness. I was never bored and I appreciated some of what the filmmakers were trying to do. I think the biggest problem with “House at the End of the Road” is that it’s a really average movie. There’s not one thing that it does exceptionally. On the other hand there are very few egregious and crippling flaws. It’s not a horrible movie but it doesn’t do anything to set itself apart. That’s why it’s a decent movie to check out on DVD on a rainy day. But expect to have forgotten all about it the next day. It’s a ‘one-and-done’ film in my book but it’s a fairly entertaining one. It just has no staying power and it won’t challenge you with anything bold and new. It turns out to be more of the same and that’s a shame. This entry was posted in Movie Reviews - H and tagged elisabeth shue, horror, jennifer lawrence, max thierot, movie review, movies. Bookmark the permalink. Seems to be a trend doesn’t it! Yeah, and I don’t get why they would do it. Didn’t like this film! Totally agree, have no idea why its classed in the ‘horror’ genre. Horror movies of all the genres should never be “blah” or “yawn” movies. That clearly shows they weren’t hitting what they aimed for. Exactly, the trailer actually seemed promising, though the story or climax wasn’t gripping nor enthralling. What a coincidence, I was going to rent this last night at the video store, even had it in my hand. Glad I didn’t get it. You could do worse honestly. But this thing has NO staying power at all. Pretty forgettable. Well I got A Haunting in Connecticut 2 instead so I think I screwed up after all. I’m sorry, but this movie blew. I felt bad for all involved, especially Shue. Like seriously, this gal can act! Give her better roles already! Good review Keith. It did leave ya yawning didn’t it? Nothing to really brag about at all. Great comments about Shue! I heard this movie is so bad that it’s actually funny, so I’m planning to watch it along with my next rewatch of Wicker Man for double feature of unintentional comedy 🙂 There’s something to these talented actresses doing awful movies indeed, but I think the bigger problem here is the overall poor quality of new horror movies. YES!!!!! You hit the nail on the head! The horror genre is a mess right now. The ideas are so bad that they have to resort to remakes. I think every major (and some minor) 80’s horror series has had a modern remake!!! I like Lawrence a lot but as you know, I don’t care for horror so I’ll be skipping this one Keith. Yawn. I agree with you that it was a mediocre at best. If I’m gonna watch a horror film, make it funny like Sean of the Dean and American Werewolf in London…. Agreed! Werewolf is 10X better than this thing! I like Jennifer Lawrence, but the movie looked like a forgettable horror film to me. Good thing I skipped it. Nice review. Good move bro! It wasn’t worth the ticket! Good review! I watched it only because I am a fan of Jennifer Lawrence. I agree with you that it is not a horror movie. Like yourself, I thought it was okay, certainly not unwatchable, but it is a movie I doubt I will be giving any thought to in the future. Thanks. Lawrence really is the only draw here. But even she isn’t enough to make me really want to watch this one again. One time is probably enough.